The gains women have made over the past several decades in labor force participation, wages and access to more lucrative positions have strengthened their position in the American workforce. Even so, there is gender imbalance in the workplace, and women who report that their workplace has more men than women have a very different set of experiences than their counterparts in work settings that are mostly female or have an even mix of men and women. 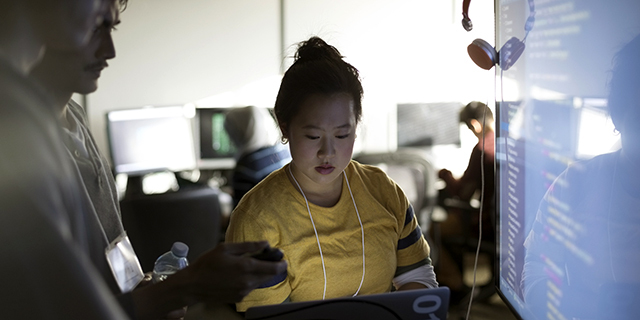 A plurality of women (48%) say they work in places where there are more women than men, while 18% say there are more men than women, according to a Pew Research Center survey. Similarly, 44% of men say their workplace is majority-male, and 19% say women outnumber men. 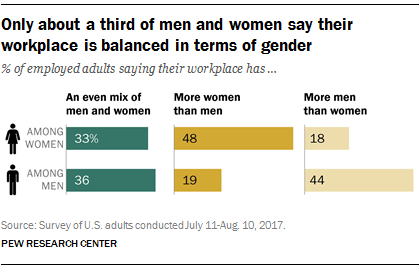 About a third of women (33%) and men (36%) say both genders are about equally represented in their workplace. The survey – conducted in 2017, prior to the recent outcry about sexual harassment by men in prominent positions – found that women employed in majority-male workplaces are more likely to say their gender has made it harder for them to get ahead at work, they are less likely to say women are treated fairly in personnel matters, and they report experiencing gender discrimination at significantly higher rates. In addition, while about half of women who say their workplace is mostly male (49%) say sexual harassment is a problem where they work, a far smaller share of women who work in mostly female workplaces (32%) say the same. Overall, most men (67%) and women (68%) say their gender has not made much of a difference in their job success. But it does make a difference for some workers, and women are about three times as likely as men (19% vs. 7%) to say their gender has made it harder for them to succeed at their job. Among women, responses vary significantly depending on the gender balance at their workplace. Only 13% of those who say they work mainly with other women say their gender has made it harder for them to succeed at work. By contrast, 34% of those who say they work mainly with men say their gender has had a negative impact. Among those who work in a more balanced environment, 19% say their gender has made it harder for them to succeed. There are big gaps as well in perceptions about how women are treated in the workplace and how much attention is paid to increasing gender diversity. Most women who work in majority-female workplaces say women are usually treated fairly where they work when it comes to recruitment and hiring (79%) and in opportunities for promotion and advancement (70%). Smaller shares, but still majorities, of women who say their workplace is balanced in terms of gender say women are treated fairly in these areas. 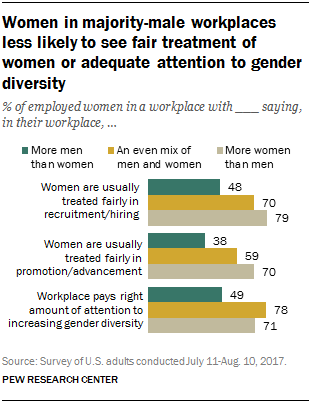 Women who work in majority-male workplaces feel much differently: 48% say women are treated fairly where they work when it comes to recruitment and hiring, and even fewer (38%) say women are treated fairly in promotions and advancement. Women who work mainly with men are also less likely than other female workers to say their workplace pays the right amount of attention to increasing gender diversity. Only 49% say this, compared with 78% of women who say there is an even gender mix where they work and 71% who work in female-dominated workplaces. In addition, when asked how often they feel they have to prove themselves at work in order to be respected by their coworkers, 25% of women in majority-male workplaces say they have to do this all of the time, compared with 13% of women who work in majority-female workplaces. The survey included a series of items aimed at measuring specific types of gender discrimination in the workplace. Overall, women are more likely than men to report having experienced each of these things – from being passed over for desirable assignments to earning less than someone of the opposite gender doing the same job. Among women, there are significant differences in these experiences tied to the gender balance in their workplace. 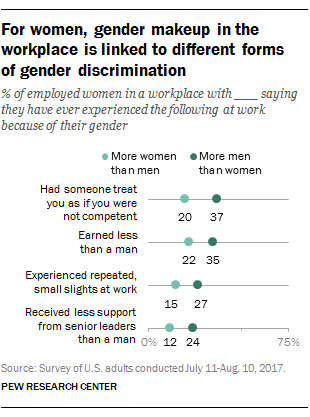 Some 37% of women who say their workplace is mostly male report they have been treated as if they were not competent because of their gender. Only one-in-five women who work mostly with other women say they’ve experienced the same thing, as do 18% of women who have an even mix of men and women where they work. And while roughly a third of women who work in majority-male establishments (35%) say they have earned less than a man who was doing the same job, fewer women in female-dominated workplaces (22%) or in workplaces with an even mix of men and women (23%) say this has happened to them. Similarly, women who work in majority-male workplaces are much more likely than those who work mainly with women to say they have experienced repeated small slights at work because of their gender (27% vs. 15%) or received less support from senior leaders than a man (24% vs. 12%). There are also gaps in the shares saying they have felt isolated, been passed over for important assignments, been denied a promotion or been turned down for a job because of their gender. In each of these cases, the experiences of women in gender-balanced workplaces are similar to those in majority-female work environments. There are modest differences along these lines in the shares of women who say they have been sexually harassed at work. Roughly one-in-five women who say their workplace is balanced in terms of men and women (21%) say they have been sexually harassed at work. And a similar share who work in female-dominated workplaces (20%) say the same. The share is higher among women who say they work mainly with men – 28% say they have been sexually harassed at work. When women are asked whether sexual harassment is a problem in their workplace, larger gaps emerge. About half of women who work in male-dominated workplaces (49%) say this is at least a small problem where they work, including 15% who say it’s a big problem. By comparison, about a third of women who work in gender-balanced (34%) or female-dominated (32%) workplaces say sexual harassment is a problem where they work. About one-in-ten of these women say it’s a big problem. Women who work in majority-male workplaces are also significantly more likely than other women to say sexual harassment is a problem in their industry. The segregation of men and women across workplaces is partly rooted in differences in the occupations held by men and women. The U.S. workforce overall is majority male by a narrow margin – 53% of all workers were male in 2017, while 47% were female. But the gender composition of many occupations varies markedly from the overall distribution, and many economists believe this also contributes to the gender wage gap. The occupations with the highest concentrations of women are in the health care, teaching or caregiving fields, according to the U.S. Department of Labor. Some examples are preschool or kindergarten teachers (where 98% of the workers are female), child care workers (96% female) and registered nurses (90% female). Although there may be differences in the occupations they hold, women who work in majority-male workplaces are not markedly different from other working women. They have a similar educational and racial and ethnic profile and a similar median age compared with women who say their workplaces are mostly female. So the differences in attitudes and workplace experiences are most likely not attributable to demographic differences.